The holiday is at the corner, and the thought inevitably flies for sea or swimming pools, tan on the sand or on the lounger and at the… swimsuits. Because stores are full of appealing offers in this chapter, and you cannot be indifferent to so many beauties, here are the 4 most important things you should consider when you decide to buy a bathing suit! The most important thing to consider is the shape of the body, because it requires a fitting suit. If you have a pear or triangle body with not too narrow or even tight shoulders, small breasts, buttocks and full hips, then you have to choose a suit that maximizes visually the top. Thus, the bra or top of the whole costume has a vivid print or steering wheel, but also the wider straps and the cup to be spongy. Also, the two-piece suit slip is indicated to be adjusted on the hips and in no case short, because it will create an impression of surplus in this area. The apple-shaped body, with narrow hips and waist and prominent bust, will benefit from high-cut suits in slippers for visual stretching of the legs. It is recommended that the top of the costume has a unique print. It also avoids the thin bra straps and chooses a little wider. 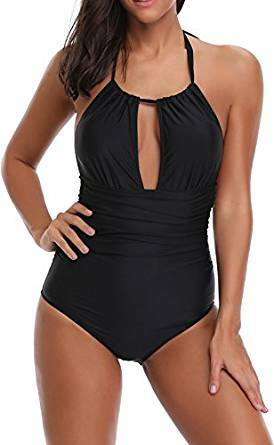 If the shape of the rectangle is characterized, when the body has a slightly more masculine and more sporty body, with shoulders, breasts, waist and symmetrical hips, choose full swimsuits with the middle cut to create the impression of a thinner waist . Do not get around the triangle bra, with or without push-up suits, which are feminine and where you can place the cup as you wish, thanks to adjustable strings. The shape of the reversed triangle of the body, where the bust and shoulders are protruding, while the waist is small and the narrow hips require a bathing suit with the straps that tie to the neck, with a bra well made to properly support the breasts. A harmonious look of the body can be achieved even better in this case with retro inspirational suits that emphasize the waist, bust and posterior. To highlight part of your body, choose a strong color or a model suite. To hide a defect, choose one color in one color. If you have open skin, choose black swimwear, dark purple, blue or brown tones. If you have darker skin, the strong colors will put you in the best position. To add volume to the bust or hip area, pick up something with the bumps. An always good choice is to wear, for example, a brightly colored bra that puts your neck in value, and a slip in a single dark color to hide some more bulky hips.